Ink jet inks are made of various formulations, of which the main sorts consist of the carrier fluid-aqueous or solvent based inks as well as the colorant itself-pigment or dye based inks. Since these elements are colloidally stable, cleanliness of inks is required to avoid plugging print machine and make inks be properly deposited onto paper, the ink must be successfully traversed micro-tube with the ink cartridge. When these colloids become unstable and agglomerate or coalesce the tube would be clogged and the cartridge fails to deposit ink. To deal with this issue, ink manufacturers have investigated filtering the ink as a last step before packaging in the hopes of decreasing the concentration of over-sized particles within the printing cartridge. Ink could be contaminated by many sources during production. 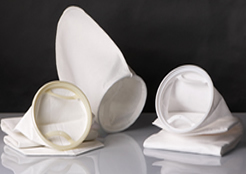 These can be of various types-fibers, solids, and semi-solids, complicating production to an even greater degree. Often, system recirculation is required to completely eliminate a contaminant. The system filter has the burden of maintaining pigment concentration and color while removing contaminants and ensuring that grind standards are met. The use of quality inkjet filtration products is essential to reduce print head or fine nozzle blockages, increasing productivity, decreasing maintenance, improving print quality and minimizing costs. Enhanced cleanliness, through filtration of aqueous or solvent based fluids and colorants within inkjet machinery, allows higher flow rates and therefore accelerated printing times. 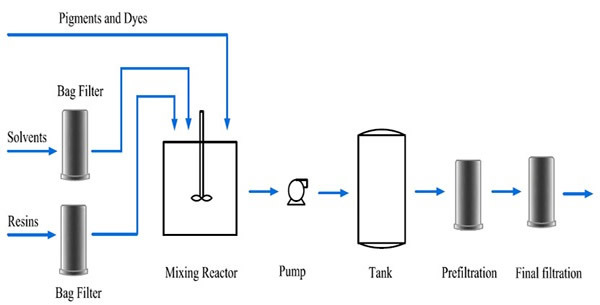 Ink Jet filtration is a filtration-intensive process. Cleanliness of the ink is required to avoid plugging the print heads or nozzles to ensure printer performance and longevity, so proper filtration technology will mean the success of your ink jet printer. Producers of pigment based inks are seeking filtration that achieves highly selective (classifying) particulate removal. These filters must remove oversize pigments, gels, agglomerates and other contaminant, while allowing the desirable sized pigments to pass through the filter and remain in solution. 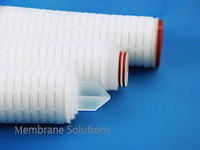 For this application Membrane Solutions generally recommends two stage filtration, filters are melt blown or pleated cartridge, final filtration must achieve 0.3-1.0μm absolute micron rating. Membrane Solutions offers specially formulated ink jet grades with a multilayer structure that achieves fine dispersion classification along with reliable gel retention to meet the demands of ink jet formulators. For dye based inks, the dyeis water soluble, can be entirely dissolved in water. But nothing is absolute, some gelatinous residues, insoluble dyes and other contaminant may be maintained in the fluids. Dye based inks possess smoothly printing, wide color gamut and beautifully colored. However, these elements will affect the printing performance. At the right moment filtration is essential. 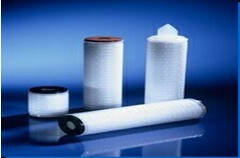 In this case two stage filtration is recommended with pleated filter selected as the pre-filter followed by Steripure PES cartridge filter as a final filter. As for solvent based inks, the current moment is its heyday. Whether for offset print, gravure, lithographic plate, tampon print or screen printing, its formula is quite mature. 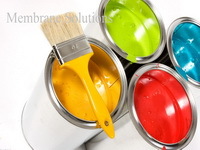 All these features make solvent based inks applied in many territories, the requirement on its quality is higher for this kind of inks manufacturers. Filtration process is an awful critical section during the ink production. 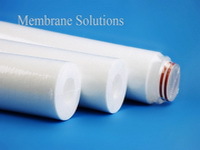 Generally Membrane Solution recommends Fiberpuremax Glass Fiber Cartridge Filter, filter bags and nylon cartridge filter to guarantee this procedure be completely successful. Believe us, these would be an appropriate choice! 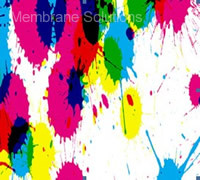 Membrane Solutions has extensive inkjet industry experience in filtration and separation technology, which allows us to design, develop and manufacture filtration solutions to suit every application. 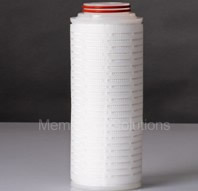 Our filter media is compatible with all commonly used solvents and chemicals, and is designed to provide consistent batch to batch ink quality, long run periods between purge cycles and minimum hold-up volume to reduce wastage and product loss during change out. Since our business became involved in inkjet filtration industry, we has been making efforts to become more professional and authoritative in this field. During the rapid development phase, Membrane Solutions has established wide and long-term cooperation relationships with a great deal of ink factories. 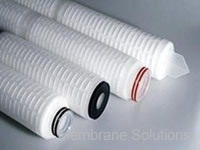 These customers present enough confidence in us and our products, meanwhile, we membrane solutions, with responsible attitude, also manufacture high-quality products as well as appropriate solutions for our customers. MS® FibermaxPure Glass Fiber Cartridge Filter cartridges deliver high efficiency and consistent filtration of fluids in a wide range to critical applications.